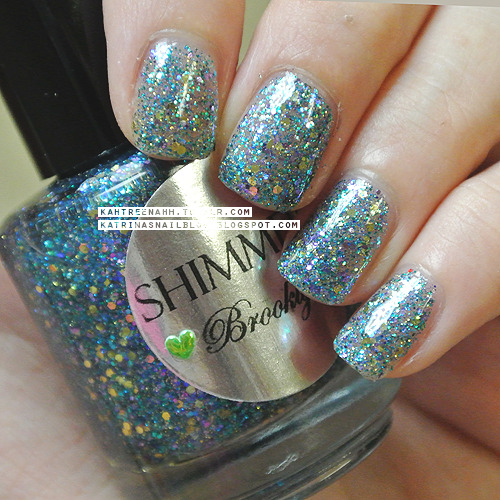 Here are the rest of the swatches of the beautiful polishes that were sent to me from Cindy over at Shimmer Polish. Just a forewarning, please excuse the horrible and inconsistent lighting in the photos. Also, I personally like to wear glitter polishes by itself -- I don't usually wear them over a base color, so all but one swatch is the glitter polish by itself. 2 coats of Elsa - with flash. 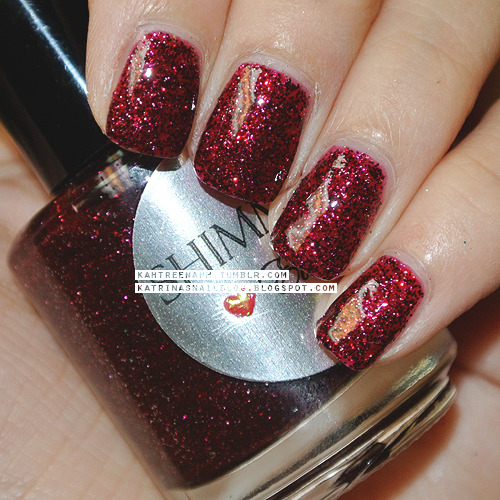 Elsa is mainly red, gold, and turquoise glitters in a clear base with tiny gold glitters. 2 coats of Elsa - without flash. 2 coats of Brooklyn - with flash. OHMYGOSH. BEAUTIFUL! Aqua blue, gold, and lavender glitters!! 2 coats of Brooklyn - without flash. Do you see those lavender glitters? You can really see it in the bottle; omg, this is such a beautiful mix. 2 coats of Alessandra - with flash. Red glitter mix with dominant (looks like) burnt orange and turquoise smaller glitters. 2 coats of Alessandra - without flash. 2 coats of Kelly - with flash. Beautiful mix of green and gold glitters. 2 coats of Kelly - without flash. Oooh, I just love how it looks in darker lighting too. 2 coats of Eva - with flash. 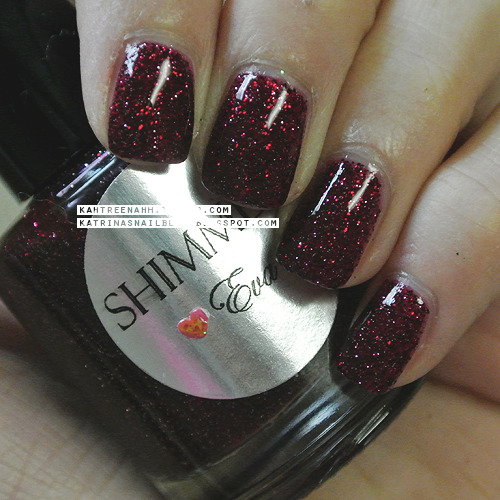 A deep red based polish with burgundy and a tiny bit of silver glitter. 2 coats of Eva - without flash. 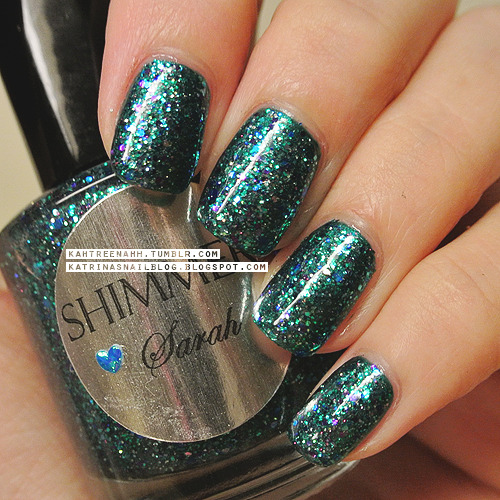 Last but not least, my most favorite of the bunch, 2 coats of Sarah over Cacee BFE's Willow - with flash. A mix of green, turquoise, gold, and purple glitters - it seriously reminds me of a peacock. It's absolutely stunning! 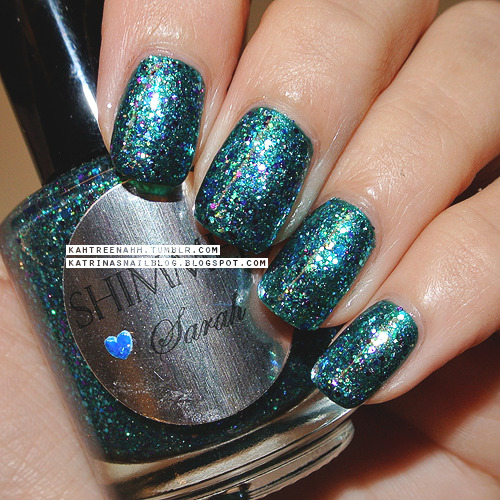 2 coats of Sarah - without flash. DO YOU SEE THE DEPTHS OF THIS POLISH!? ... absolutely beautiful. The purple and gold glitters are more visible irl. Pictures do absolutely no justice to Sarah. And this is 2 coats of Cacee BFE - Willow before I applied Sarah over it. It's the perfect base for Sarah. 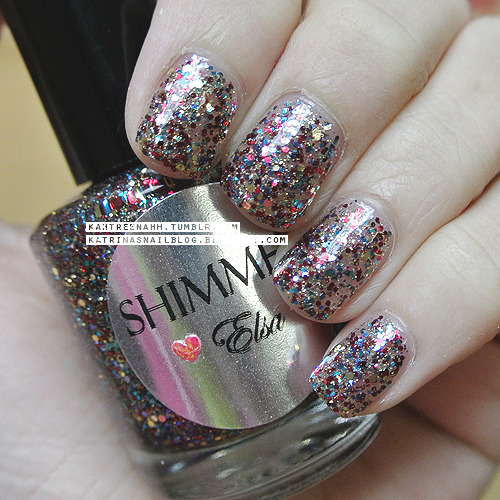 I do like to see glitter polish swatched on its own, lovely swatches! Eva looks realllly good on you! 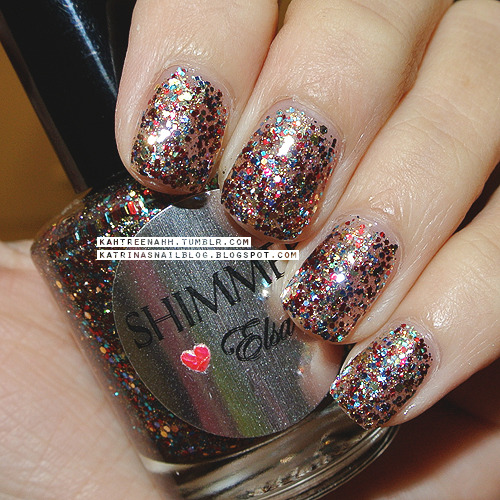 These shimmery polishes are so gorgeous! Thanks so much for the fabulous info! Please join our FB community and share your nail art on our wall. We help our fans get their nail art featured in print and online beauty publications, and you have the talent to be featured often!